Adria is a name familiar to many Australian caravanners. The Slovenian manufacturer has, for quite a few years, had a small but increasing range of caravans available in Australia via several importers, but no motorhomes. 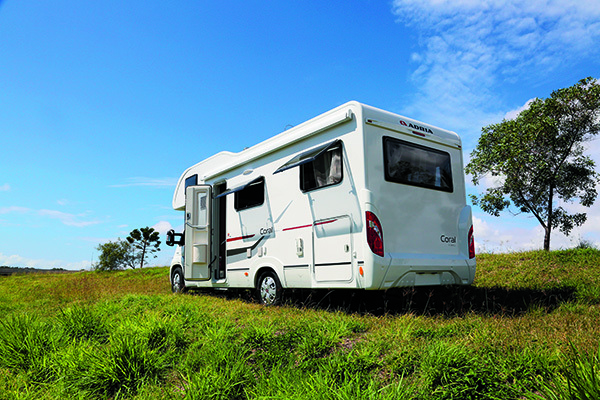 That changed when the Apollo Group, the current importer of the Adria range, decided to bring the A660DU motorhome, otherwise known as the Coral – a much more travel-inspiring name – to Australia! I thought that the Coral was an interesting choice by Apollo. It’s a six-berth motorhome, which really makes it more suitable families and rental companies. So how does it stack up for a couple on the road? There are no surprises in the motive power department; the Coral has the familiar Fiat Ducato 180 Multijet as its base vehicle. Adria has not made the mistake of using the lower-powered Ducato engines but instead has opted for the 132kW/400Nm turbodiesel that we are all used to. With a GVM of 4400kg and a Tare weight of 3500kg, the Coral has a very good load capacity of 900kg. What’s interesting about the Coral chassis is that Adria has opted to use airbags for the rear suspension – not unheard of in motorhomes but usually reserved for those right at the top end of the market. That improves the comfort and handling characteristics of the motorhome, which is great for any passengers travelling in the rear. Additionally, the airbags are easily adjusted because the controls are located on the base of the passenger seat. Although the Coral is a C-class motorhome, the Luton peak that extends back almost halfway along the motorhome gives the body shape a less bumpy look than is often associated with C-class units. The body structure consists of a polyurethane/polyester sandwich roof and walls, along with fibreglass mouldings for the curvy bits. The windows are the familiar Euro style (acrylic, tinted and double-glazed), while the door also has the Euro look and comes complete with the standard moulded-in garbage bin and internal insect screen. A quick scan of the Adria UK website reveals its Adria motorhomes have the door on the offside, proving that this motorhome is specifically built for the Australian market. The door also has one other feature of note – central locking, along with the driver’s cab doors. This means the Coral only comes with two keys, one for the ignition and one for the storage bins, unlike so many other rigs I’ve seen where there’s a different key for everything. The Coral bodywork has two external storage bins. The one behind the driver’s door is for the two 4.5kg gas cylinders but the other makes the most of the available space. It’s a tunnel boot across the rear with large doors on both sides that are easily accessible. Part of the air space in the middle is taken by the internal floor area but there is still plenty of room for all kinds of goodies. Also fitted into this section is the Truma water heater – it is out of the way but still easily accessible for any maintenance. Along the nearside wall, in addition to the usual 240V mains outlet, there are 12V/5V USB outlets and a gas bayonet socket – this is a well kitted-out motorhome. Unless one has an elevating or drop-down bed, six-berth motorhomes tend to have a similar layout and this one follows the theme. It has a club lounge in the rear, a mid-offside dinette – both convertible into beds – with the third bed being in the Luton peak above the cab. 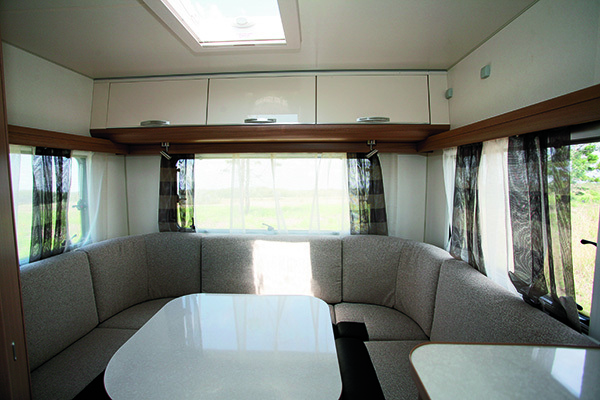 That allows room between the dinette and rear lounge for the bathroom and the nearside wall for the kitchen facilities. 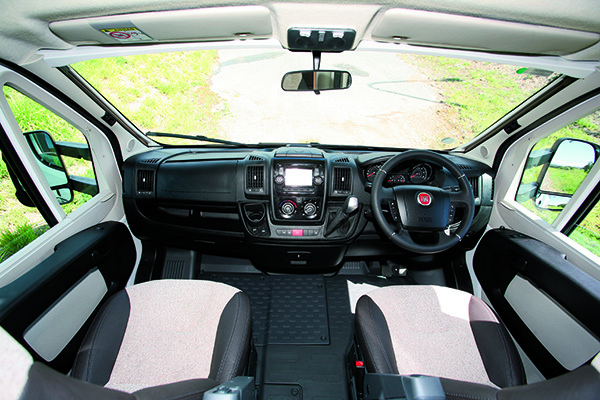 In the Fiat Ducato, both cab seats can swivel around but that is not really an advantage here – the driver’s seat has the dinette seat back behind it and the passenger seat has the bulk of the 190L fridge to the rear. That does make cab access a bit tight but the saving feature is that the Luton bed can be lifted out of the way if not needed – a feature curiously absent on Apollo’s locally-built motorhomes. Not surprisingly, the Coral decor looks much like that of Adria’s caravan range – an interesting mixture of the faux timber look and a more contemporary style. Although the windows all have the integrated blinds and screens, all except the kitchen and bathroom have rather chintzy net curtains. I know they give privacy during the day time, while still allowing light and ventilation but they’re not my favourite feature. Catering is handled by a typically Euro-size (i.e., compact) kitchen. It comes with the neatly designed stainless steel combo cooktop and sink that has an L shape. The minimalist bench length is a space saver. As are the three drawers fitted in along with the grill/oven. Above the kitchen bench, the overhead lockers have an extra shelf fitted. The microwave is not located in the lockers but above the fridge instead. A slight problem here is the microwave is hinged conventionally on the left-hand side, so is a bit awkward for this location. At the doorway end of the kitchen bench, three small open compartments have been built in – handy for use from inside or outside the motorhome. At the other end of the bench, the three-quarter height cupboard offers a comparative good amount of hanging space, as well as a good-sized shelf area. Above that the wall area is not only used for the flat screen TV wall mounting but also for 240V and 12V outlets plus the hot water service switch. Across the way, the dinette will seat four people relatively comfortably and all seats have both seat belts and high head restraints. A double powerpoint is located in the seat base near the wall. If needed, the dinette can be easily folded down with the seats extended into a bed that measures 1.95x1.35m (6ft 5in x 4ft 6in). In the rear, the club-style lounge has curved corner cushions, windows all round and overhead lockers across the rear wall. Like the dinette, the club lounge will make up a bed that is well sized at 2.1x1.57x1.37m (6ft 11in x 5ft 2in x 4ft 6in). A minor problem is the seat backs used to fill the table area don’t quite sit flat. Remarkably, the bathroom is somewhat larger inside than it looks. There’s enough room inside for a separate cubicle shower, cassette toilet and a small vanity cabinet with washbasin and several upper and lower cupboards. Ventilation is supplied by a large window and a roof vent. Electrics are fairly standard with a 100Ah deep- cycle battery and a 25A mains charger. Solar panels are an option but unless you’re planning long stays away from mains power, not a total necessity. There are 240V powerpoints located all over the motorhome, although some are in slightly odd places. As I noted previously there are 12V/5V USB sockets outside the motorhome but, oddly, not inside. A simple-to-use control panel is fitted above the entry door. The radio/DVD player is hidden inside one of the overhead lockers above the kitchen bench. Looking over Adria’s Coral motorhome is quite revealing. It’s the only Adria motorhome I have seen; they are not even available in my other stamping ground, New Zealand. 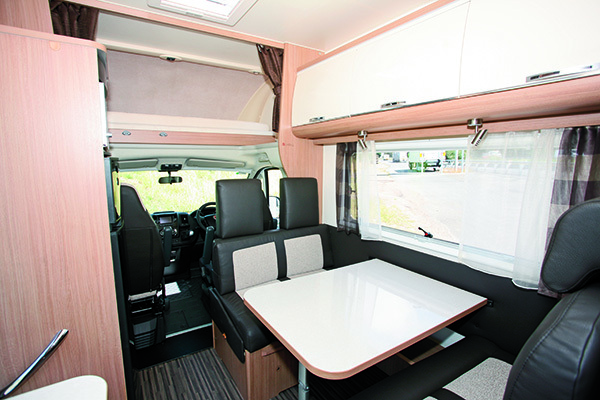 It is a well-appointed motorhome and, although the six-berth layout is not going to attract those who want an island bed, it certainly has potential for a family and for anyone happy to make their bed up every night. What is also interesting is that this six-berth layout could easily be used as a rental motorhome but it really doesn’t have a rental look about it at all, and that augurs well for any other Adria models that Apollo might choose to bring into Australia.